Now through the end of 2010, Hornady is offering a FREE 100-ct box of bullets when you purchase any New Dimension Die Set with Zip Spindle™ System (Series I, II or III). Those FREE bullets are worth up to $30.00, making this an attractive deal. Hornady makes good dies. This Editor uses Hornady New Dimension dies for most of my handgun cartridge reloading, as well as for reloading my 45/70 cases. The Hornady dies I’ve used have been dimensionally correct, well-finished, and durable. When I did manage to break a decapping pin tip on a stubborn primer, Hornady promptly sent me not one but two replacements at no charge. To claim your free bullets (after purchasing a die set), you need to download and fill out Hornady’s redemption form (PDF). Submit that with Proof of Purchase, and wait 8-10 weeks for delivery. You must choose a box of bullets from the list below. (Bullet MSRPs are shown in right column.) CLICK HERE to download Hornady 2010 ‘Get Loaded’ Redemption Form. 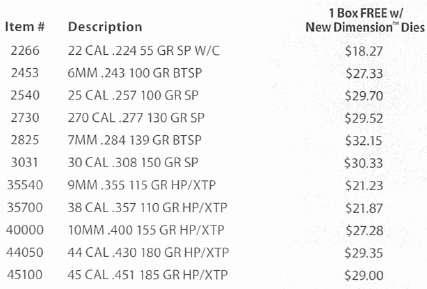 Share the post "Hornady Offers Free Bullets with Purchase of New Dimension Dies"
I just purchased a set of Hornady dies from Cabelas, 450 Bushmaster…the dies have a sticker on the box referring to 100 free bullets…when I went to this website, the form is for 2010. So, did I buy something on a promotion that doesn’t exist or is it valid?? If valid, how do I determine the shipping costs I’m supposed to pay? I’ve bought Hornady bullets for at least 30 years, and this is pretty frustrating. What gives. I just bought .375 dies with the same sticker. Somebody should be responsible and honor the ad. I also brought a set of die .308. I have tried to use the form to get the 100,30 cal. bullets have had nothing but trouble getting thru. 6.5 CREEDMOOR 2 DIE SET. Been trying to get form for free bullets, but been having nothing but problems getting thru. what can be done??? I just read that offer expired 12/31/2011.